2000 cubic inches is pretty large…and that’s the main reason I delayed so long in posting a review of this bag; during the warmer months, I just don’t have much to carry. Further, on a hot day, this bag covers my entire back, leaving me extremely sweaty. During the summer I used the Banjo Brothers bag as a beach bag…it allowed me to carry two beach towels, drinks and snacks and let me keep my hands free to carry toys and to hold my boy’s hand while we walked the 1/2 mile to our secret spot on Pass-A-Grille Beach. Now that the cooler months are here, I don’t mind the extra coverage on my back, and I can ramp up the amount of stuff I carry (books, papers, a wind/waterproof jacket, lunch, balaclava and gloves, repair tools and a mini-pump, etc.). The Banjo Brothers bag handles loads like this wonderfully. Construction of the bag is adequate. The stitching isn’t as tight as I’m used to seeing, but at least it is even and the thread is strong. All the fabric edges are covered by finer-weave nylon and the attachment points for the straps are either bar-tacked or sewn on with a strong “X” pattern…very sturdy. I’ve had no stitching or fabric failure since I started using the bag back in May, and I’ve hauled a couple of pointy, heavy loads. 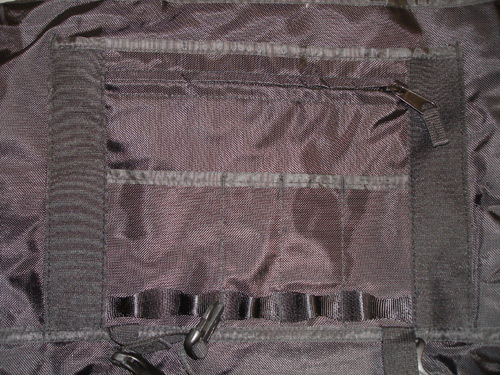 The bag is held shut by means of two quick-release buckles and a pair of vertical strips of hook and loop material. 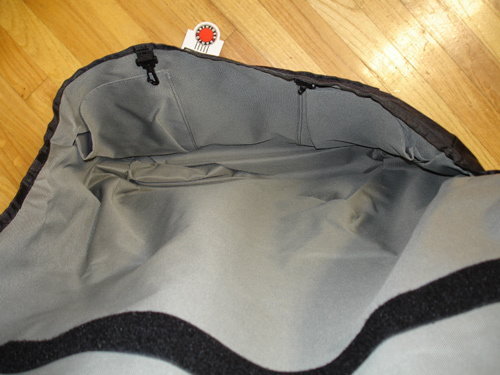 The bag’s closure system allows it to adjust for some pretty big loads, and that’s always a nice feature! 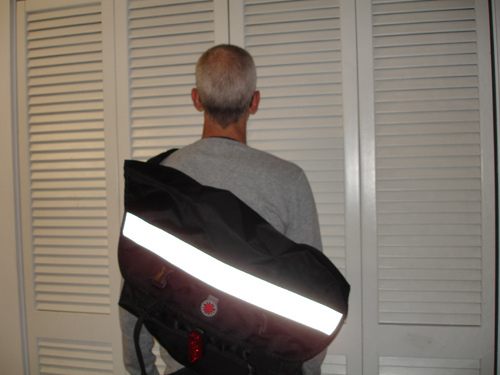 Over the outside of the flap is a bag-wide strip of highly reflective material. The reflective stuff is pretty noticeable, wouldn’t you say? The shoulder strap system is made of wide but soft seatbelt webbing with a large integrated pad and an easy-to-use adjustment buckle. 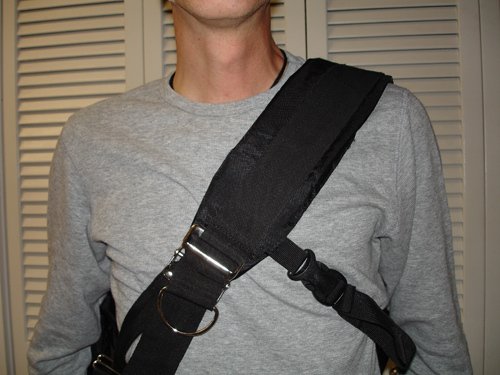 The harness also includes an anti-sway strap that fits under your arm. The bag’s harness is designed to go over your left shoulder, and there’s no way to swap that out for “righties”, as the straps are sewn directly onto the back of the bag. This is first messenger bag I’ve tried that is truly “on the fly” adjustable…with some bags, you’ve got to release a clasp or similar to lengthen or shorten the shoulder strap; not so with the Banjo Brothers bag — merely grab the bottom of the strap, hitch the weight of the bag onto your upper back and pull the strap. Voila — adjusted! To lengthen the strap, simply place your thumb under the chromed clasp and push upwards. It’s quick and painless and very effective. One minor gripe I have with the bag isn’t really the fault of the bag, per se…because the padded area of the strap is wide and my shoulders are narrow, the bag has a tendency to slip off my shoulder. One time, the strap slipped and pinned my braking arm against my side as I approached an intersection! This problem only manifests itself when loads are light…the heavier the load, the more stable the strap (and the whole bag, for that matter) is. To prevent this from happening with lighter loads, I squeezed on a few thin bands of clear silicone to the underside of the pad…it doesn’t slip anymore! A lot of bag manufacturers will sell you the main bag, but if you need to carry a laptop and a cell phone you may need to purchase accessories such as a padded sleeve or a holster. Not so with Banjo Brothers — both of these items are included in the purchase price. Earlier, I mentioned waterproofing. Up until yesterday, I hadn’t had a chance to test the bag in wet conditions…but on the way to work yesterday I got caught in a fierce storm, soaking me to the bone. When I arrived at work, I had to pour water out of my shoes! Lo and behold, my work clothes and other belongings were absolutely dry inside the bag. Whew! 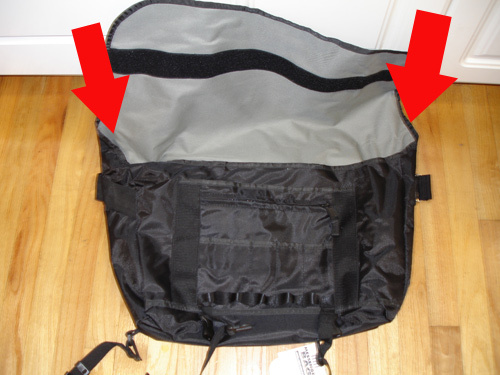 One of the tricks Banjo Brothers uses is the way the body of the bag and the lid are cut…extra “gussets” fold down as the lid is closed, creating overhangs that eliminate water-entry points at the corners. Timbuk2 users will know that despite the heavy truck tarp interiors of their traditional messenger bags, those exposed corners will let a bit of water in — glad to see that Banjo Brothers (and other bag makers) have addressed this with a little creative fabric cutting. Overall, I really enjoy using this bag — the harness takes the sting out of a heavy load and prevents that load from swaying too much. The more cargo, the better the bag feels and performs. I trust its waterproofness now that I’ve had a chance to see it in action, and it’s got enough organizational features that lets me carry my things without a lot of hunting around for small bits. Yes, it is a rather plain-looking bag…and no, there are no customizable liner colors, stripes, accessory pockets or wild exterior color schemes to choose from as with other bag makers…if it bothers you, sew on a ZPG patch and be done with it! Banjo Brothers makes a couple other sizes of messenger bags and they also make a fantastic backpack (reviewed on our sister site The Bike Geek: click here for the review). They’ve also got a wide range of other cargo solutions for bike and for body…all at great prices! Check them out by visiting Banjo Brothers on the Web. The more I hear about Bango Brothers/ Minnehaha the more I like them. 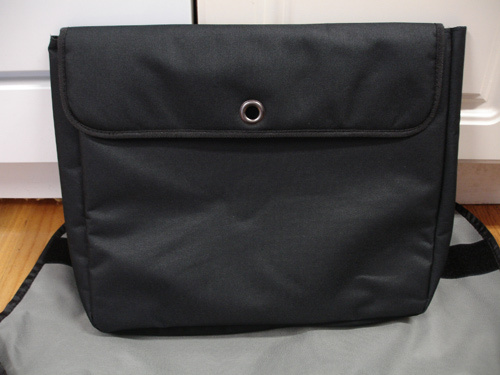 The design of this bag is similar to Chrome messenger bags, which are far superior, though at half the price. 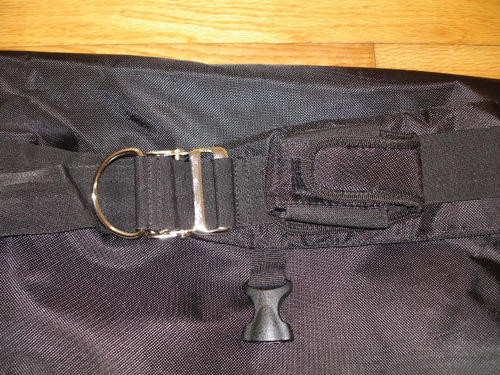 Yes, the layout IS similar to the Chrome bags…Banjo Brothers used to have their own version of the seatbelt buckle quick-release strap (they used a carabiner and a nylon web loop), but they realized that users rarely took advantage of this feature. I have this bag and like everything about it except the anti=sway strap. It hits me in the same area that it looks to be hitting you and because I have a little more i n that area, it is not comfortable. The only thing I’d change is to make the strap adjustable where it connects to the shoulder strap. You know, I kinda wish that strap location was adjustable, too. Obviously, I have nothing to squish in that area 😉 … but I prefer the strap a little lower. In practice, though, the strap works fine where it is — keeps the bag from swaying too much. I use my seatbelt buckle quick-release all the time. Or, I did before I had panniers. I have the Chrome Metropolis, which can carry a lot. It’s difficult to remove when fully loaded with heavy groceries, so I just push the button and catch it on the way down. Thanks for the review. I have liked Banjo Bros for a while. I’m not concerned that it’s like Chrome, and actually prefer it more without the seatbelt/buckle. Nice pictures, too. I have never had a messenger bag w/ the d-loop. Out of the hundred bags I’ve had, not one…. (ok maybe 5 bags). Anyway. Do they really add lots of functionality to bags? I suppose the D loop is a place to clip your keys…but the jingling will drive you crazy! @Ghost, I clip my keys in a similar fashion on my bag – no jingling issues to report. Really? I have my full set of keys (4 plastic-coated bike lock keys and my house key…no car keys here!) on an aluminum carabiner, and the jingling drives me nuts. Do you tuck the keys into a slot or something to keep them from moving around? 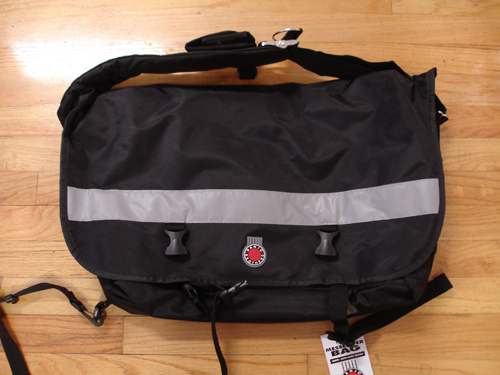 I got a great messenger bag from Bike Nashbar about a year and a half ago. It still has it’s waterproof qualities and I only paid $24.99 for it! I would like a reflector strip as wide as the Bango Brothers bag, though. By looking at your websites photos, I now know what that extra narrow strap that came with it was for- I tossed mine. My bag does need to be given a shove back into the right position every few yards. Andrea, you should see if Nashbar has a spare strap you can get…it makes all the difference in functionality when you can prevent bag sway!